Since the previous parameter and review paper publication on oral appliances (OAs) in 2006, the relevant scientific literature has grown considerably, particularly in relation to clinical outcomes. 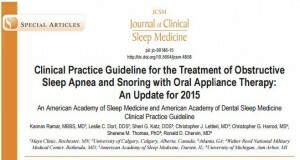 The purpose of this new guideline is to replace the previous and update recommendations for the use of OAs in the treatment of obstructive sleep apnea (OSA) and snoring. The American Academy of Sleep Medicine (AASM) and American Academy of Dental Sleep Medicine (AADSM) commissioned a seven-member task force. A systematic review of the literature was performed and a modified Grading of Recommendations Assessment, Development, and Evaluation (GRADE) process was used to assess the quality of evidence. The task force developed recommendations and assigned strengths based on the quality of the evidence counterbalanced by an assessment of the relative benefit of the treatment versus the potential harms. The AASM and AADSM Board of Directors approved the final guideline recommendations.